The versatility of tea is endless. 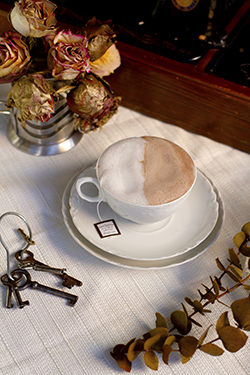 Transformed through the ages, this timeless drink can be steeped to suit any occasion. Follow along with us this month as we put a twist on old favorites, offer our own fresh ideas and introduce new tea products! Description: Sit back, relax and enjoy this combination of tea and alternative milk. It’s the perfect way to forget all about your day and cast away the cares of tomorrow! Directions: In your favorite mug, steep the tea and honey together in hot water for 5 minutes. 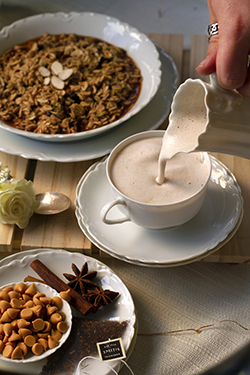 Steam 2 star anise together with the almond milk. Pour the milk over the tea and enjoy! Description: In this drink the naturally sweet and earthy notes of rooibos tea (succulent honeybush and a bit of orchard fruit flavor) pair nicely with the candy taste of butterscotch. 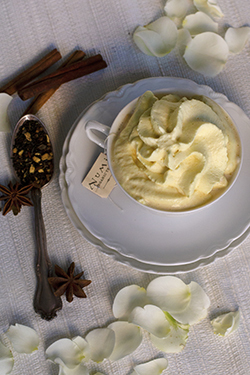 Topped with cinnamon-infused steamed cream, it’s a delicious addition to any breakfast! Directions: In a 10 oz. cup, steep the tea and butterscotch syrup together in hot water for 5 minutes. Combine the cinnamon and Half & Half in a steaming pitcher and steam it to 140 degrees. Remove the tea sachet, if you wish, and top the cup with steamed Half & Half. Enjoy! Description: What’s black and white and green all over... A Matcha Mint Zebra Hot Chocolate! Adding the Matcha Mint Tea really adds a refined aspect to a traditional zebra hot chocolate. Directions: Steam the almond milk and powders together. Pour the blend over the tea and steep it for 3-4 minutes. Stick your pinky out and enjoy! Description: Soothing lavender and sweet vanilla are the perfect addition to this frothy tea favorite. Directions: Steep the tea in 7 oz. of hot water for 5 minutes. While the tea is steeping, froth up 7 oz. of minor figures with the lavender and vanilla syrup. Pour the steamed blend into the tea. For added pleasure, drink with your pinky out. Description: This bright citrus tonic is as vibrant as the changing leaves and as crisp as the autumn air. 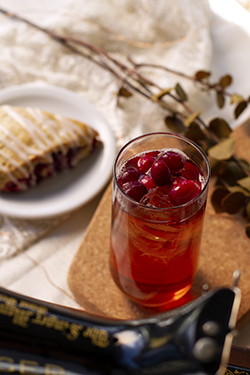 Brimming with black tea and berry sweetness, it is the perfect fall refreshment. Directions: In the serving cup, steep the tea and syrup in 2 oz. of hot water for 5 minutes. Next, add cold water and ice. Gently stir and top with fresh cranberries. 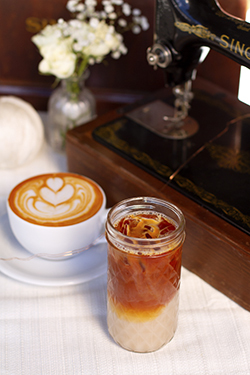 Description: Vanilla and sarsaparilla paired with the earthy tones of rooibos make this subtly sweet drink a great way to wind down anytime. 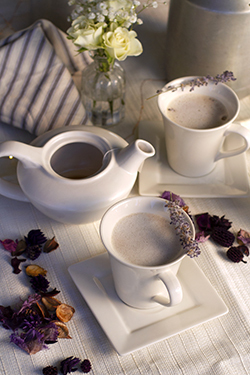 Description: Balanced with the subtle sweetness of maple and lavender, this spicy Masala chai offers the comfort of a cozy breakfast nook on a foggy morning. 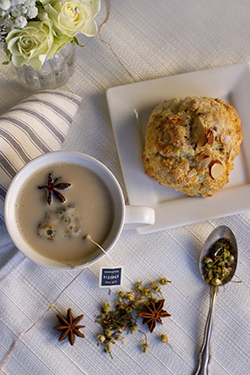 Topped with cinnamon, nutmeg and honey, let this rich tea latte transport you. Directions: Steep the tea sachets and syrups in hot water for 5 minutes. Steam the oat milk and pour it over the tea. Finally, drizzle honey in a crosshatch pattern on top and garnish with a sprinkle of nutmeg, turmeric and cinnamon. 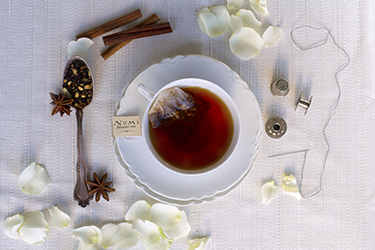 Description: This rich tea contains a warm blend of cinnamon, cardamom and ginger. Topped with sweet coconut and spicy turmeric chai whipped cream, this golden delight is the perfect complement to an evening spent watching the sunset. Directions: Steep 1 bag of Numi Golden Chai in 8 oz. of water for 4-5 min. Top with Coconut Turmeric Whipped Cream and garnish with Turmeric Chai powder & star anise. Whipped Cream: Start by dissolving 1 tsp. of the Numi Turmeric Chai powder in 1 oz. of water. Pour 1 ½ oz. of 1883 Coconut syrup, the Numi Turmeric Chai mixture and 2 cups of heavy whipping cream into the iSi Profi (quart capacity). Seal it according to the iSi Profi Instructions, add a fresh iSi N2O Professional Cream Charger and shake. Description: A little hipster, a little sweet roasted and a little earthy, this matcha latte is nuanced enough for a refined high tea but punk enough to proudly proclaim that it’s 100% dairy-free. Directions: Combine the Matcha powder and hot water in the bottom of the serving cup. Stir until the powder has completely dissolved. 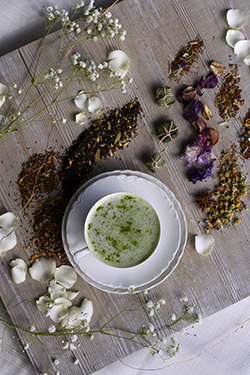 Steam the oat milk and syrup together in a steaming pitcher and pour it over the matcha brew. Enjoy!